Kronak takes a small vanguard of thunderscorn through the realm gate. Their first step towards finding a way home. They arrive in the realm of Ghyran and quickly discover five other forces to contend with. "To arms brothers and sisters." 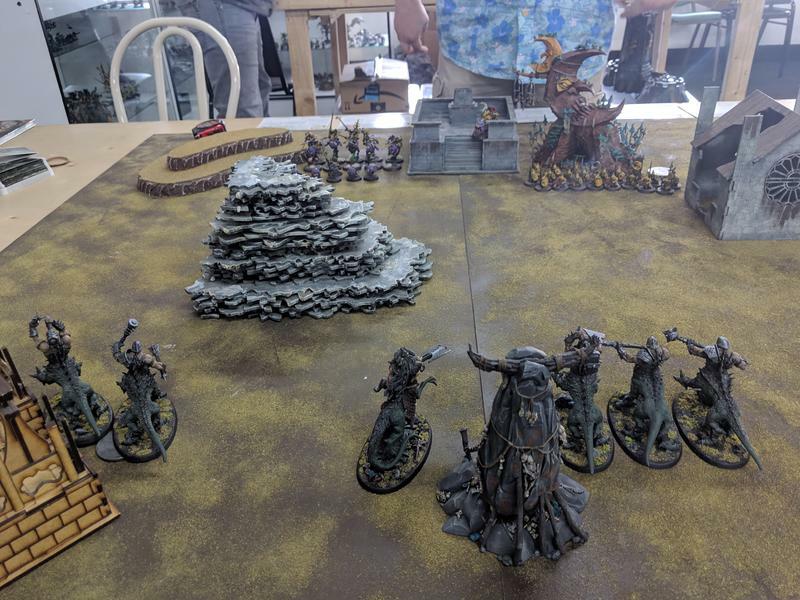 We had a small tournament with 500 pt armies we built for the campaign. We played 4x4 tables with a bit of narrative. Realm was Ghyran and each game gave benefits to winners. 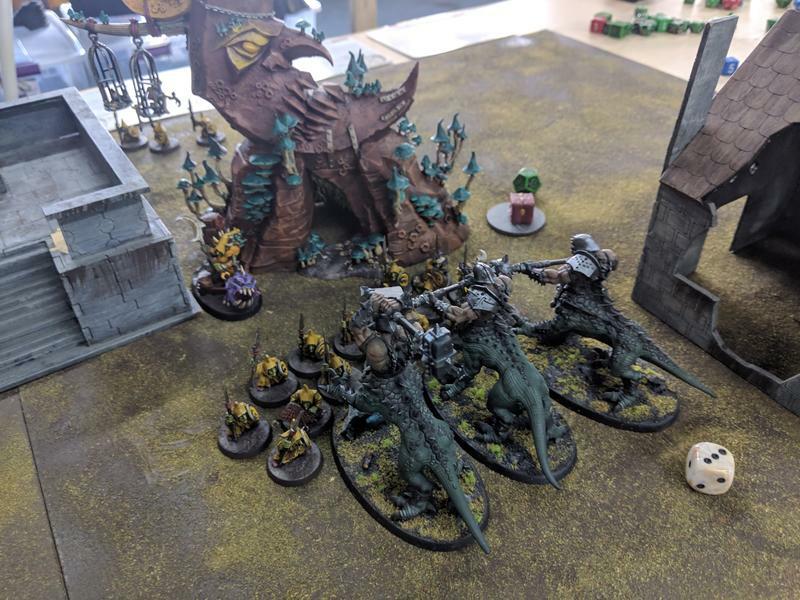 First game was against Beastclaw Raiders. He had even less models than I did. I think he had a Huskard on Stonehorn and a unit of two Mournfang. He basically ran across the table with both, destroyed one unit of Dragon Ogors. By the next turn I was wiped out. I think I killed one Mournfang. Game two was against Kharadeon Overlords playing Places of Arcane Power. I went second. 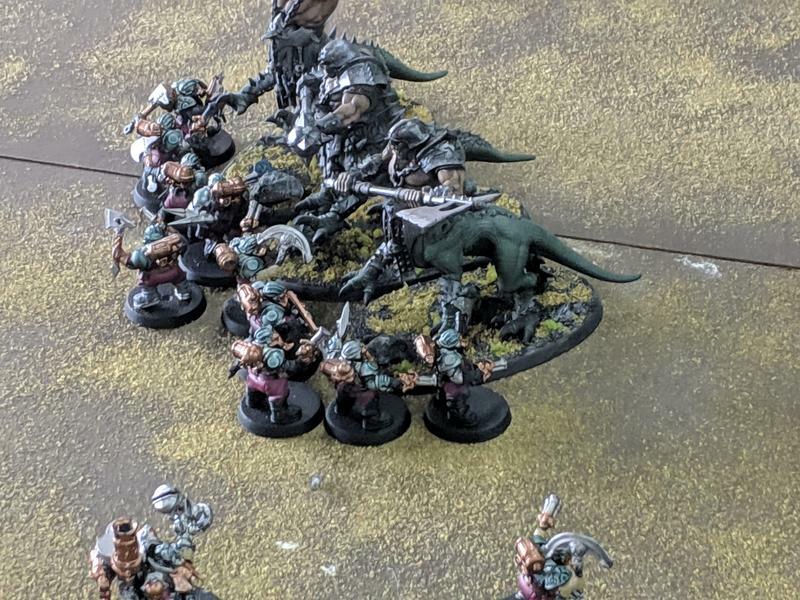 My Shaggoth took a side objective out of LoS and the Dragon Ogors ran across the field and fought the dwarves. In the end I had a ton of points and won but all but one Dragon Ogor and all dwarves except the general were dead. 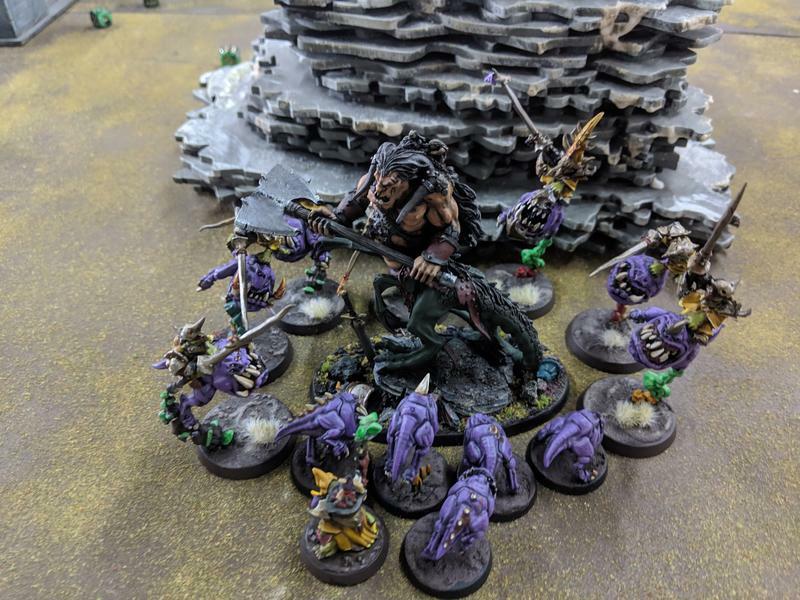 Game three was against Moonclan. It started good. I got the double turn and charged his bounders on one side and his spear grots on the other. Unfortunately I out ran my Shaggoth and didn't get rerolls. 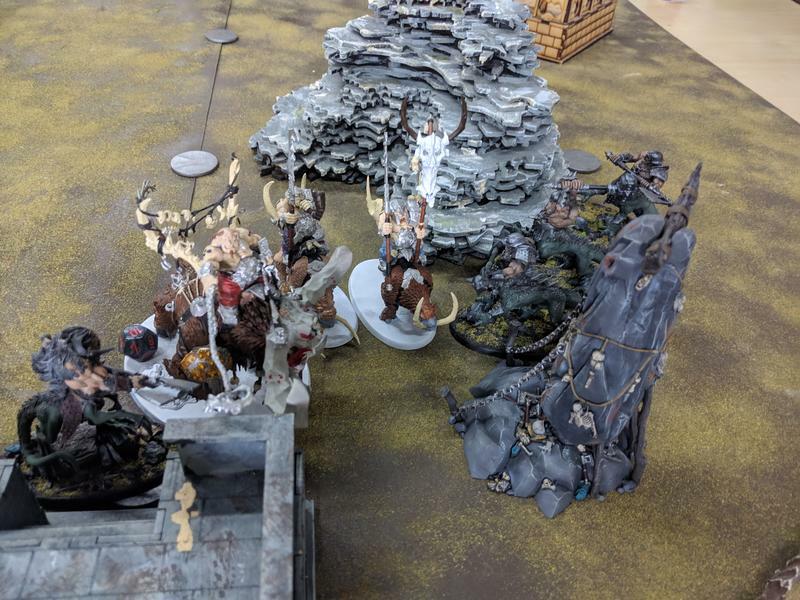 Eventually the bounders slaughtered the Dragon Ogors charged and killed the Shaggoth (their charge is rough). Dragon Ogors on the other side did well but I lost on points. This was my first time playing DO. They are very medium. Kinda fast, kinda tough, kinda killy. I definitely need to figure out how to play them.  What would you say were your greatest weaknesses and strengths? Perhaps supporting your line with throw away units of ungors or double downing on another shaggoth could help get out some mortal wound spells. Could be a fun opportunity for conversion. Really small armies so it is hard to draw any real conclusions. I really should have just kept them together and close to the Shaggoth. I'm adding Ungor raiders to give oppenent another cheap target and roam for objectives. I'm also adding Beastigors for a hard counter punch. I think the Dragon Ogors could be a good distraction or reserve unit.